Quick ride up the road today and I’ve got the engine light flicking on and off and there is a lack of power from about 3000 revs onwards any ideas? Are you sure it is the engine light and not the traction control light coming on? Or is it only happening when you go past a certain point when turning the throttle ? as that could be the throttle position sensor that is going faulty. Mine was ok under gentle throttle use but if i cracked the throttle open quickly it wouldn't accelerate. it would also sometimes just cut out completely if i was heavy handed with the throttle and put the engine warning lights on .I turned it back off and on and it would restart after a while . 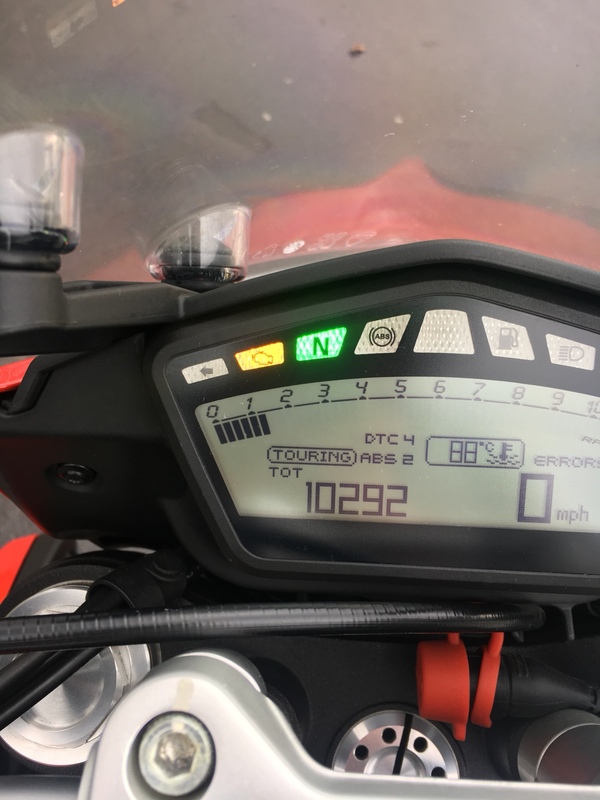 Right ,not the traction light then... are there any of the other symptoms mentioned ,as the throttle is well known to Ducati? Other than that it is a case of getting your dealer to stick it on the diagnostics computer . Similar symptoms to my O2 sensore failure, but yeah if it's throwing error codes getting those read is the thing. Sounds like limp mode. Check engine light certainly indicates something is wrong. If you go into the settings menu, it should tell you what the error is related to, in regards to drivetrain/engine, but won't tell you the fault code relating to which component is faulty. Had mine into the dealer for similar fault and was confirmed that it was the front lambda sensor. I was touring Ireland at the time, but the bike was running ok. I checked the wiring to the Lambda sensor when I got home with an Ohm meter and confirmed that it was faulty. Got a second hand sensor from ebay for a few pound and fault gone. I think that my bike ran ok with the faulty lambda sensor due to the Rapid Bike module being in place. i am not sure what happens when 1 lambdasensor is faulty, i suppose the same as without lambda. running the bike with both sensors disconnected lets bike run all the time in open loop via the internal map. runs a lot better than with lambda correction. only negative thing - yellow check engine light is on . This was the case with my 821. With my 939 i did not try until yet. Last edited by ferdi; December 30th, 2017 at 09:21 AM. What year bike. If prior to 2015 did you have your TCU replaced? Sure sounds like limp mode. Error code came up "BBS"
Turns out it was a broken wire to the bbs unit.